20. Peter Seaman Cleghorn Wood. Son of George Wood & Margaret "Maggie" Piercy. Born 16 May 1868 in Tweedside. Christen 19 Oct 1868 in Harvey Presbyterian Church. Died 13 Jan 1902 in Tweedside. Buried in Harvey Settlement Cemetery. Peter, his wife Jane, and their two infant children all died of diphtheria within four days, in January 1902. Source: Ross Wood, Tweedside, Harvey, York Co., N.B. Rephotographed, by Tim Patterson, 7 Aug 2008. 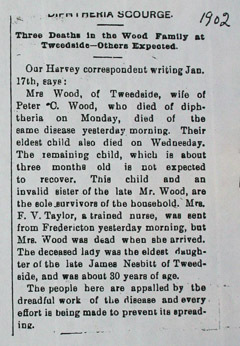 Three Deaths in the Wood Family at Tweedside--Others Expected. Mrs Wood of Tweedside, wife of Peter C. Wood, who died of diphtheria on Monday, died of the same disease yesterday morning. Their eldest child also died on Wednesday. The remaining child, which is about three months old is not expected to recover. This child and an invalid sister of the late Mr Wood, are the sole survivors of the household. Mrs F. V. Taylor, a trained nurse, was sent from Fredericton yesterday morning, but Mrs Wood was dead when she arrived. The deceased lady was the eldest daughter of the late James Nesbitt of Tweedside, and was about 30 years of age. The people here are appalled by the dreadful work of the disease and every effort is being made to prevent its spreading. Harvey Station, York County, Jan. 18 -- A whole family, father, mother and two children, have been cut off by diphtheria in Tweedside. 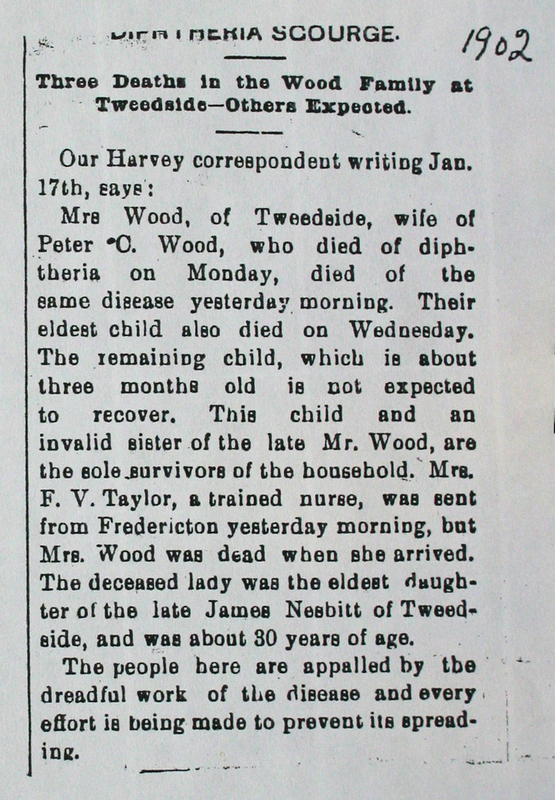 On Friday evening Peter C. Wood contracted the disease and died Monday, the elder child died Tuesday and Mrs Wood died on Thursday morning and the younger child a few hours later. The disease is of the most violent type and proved quickly fatal in spite of the best methods of treatment. During the illness of the family their friends and neighbours prepared and brought food and other things necessary, but did not dare enter the house, and the doctor was unable to obtain the nursing required for his patients. Mrs Nesbitt, Mrs Wood's mother, did everything she could to care for them, but she soon became exhausted. Some of the parish officers and others, when they became aware of the state of affairs on Wednesday, joined together and wired Dr. Mullin of Fredericton, asking him to send a trained nurse for Mrs Wood and the child. The doctor at once complied and the nurse arrived Thursday morning only to find Mrs Wood dead and the child dying. Two other families in Tweedside, who had the disease are all recovering, and there has been no further spread of the disease. The dreadful occurrence has cast a deep gloom over the entire community and much sorrow is expressed, as the young couple had many friends and were highly respected. He married Sarah "Jane" Nesbitt, daughter of James Nesbitt & Mary Carmichael, 30 Aug 1899 in York Co., NB. Born 12 Jan 1877 in Harvey. Died 16 Jan 1902 in Tweedside. Buried in Harvey Settlement Cemetery.